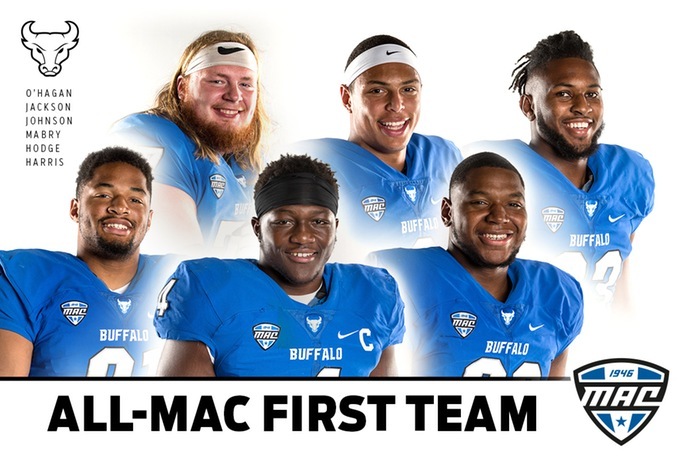 CLEVELAND, Ohio – A school-record six University at Buffalo football players were named to the All-Mid-American Conference First Team, the league announced on Wednesday. Overall, the Bulls had 10 players named All-MAC, also a program best. The first-team selections included quarterback Tyree Jackson, center James O'Hagan, wide receiver Anthony Johnson, tight end Tyler Mabry, defensive end Chuck Harrisand linebacker Khalil Hodge. Buffalo placed four on the All-MAC Second Team, including running back Jaret Patterson, left tackle Evin Ksiezarczyk, cornerback Cameron Lewis and wide receiver K.J. Osborn. Osborn was also named to the All-MAC Third Team as a punt returner. Jackson, who was also named the MAC Offensive Player of the Year, is the first quarterback in school history to earn All-MAC honors. The junior signal-caller is having the finest season of his career. He has thrown for 2,605 yards and 25 touchdowns and has rushed for seven more scores. He has accounted for 32 touchdowns on the year which is a school record for a single season. This is the third season O'Hagan has been selected to an All-MAC team, but the first he has received first-team honors. The senior center is the anchor of Buffalo's stout offensive line. He has helped block for a rushing attack that has piled up 2,406 yards on the ground – the most in UB's FBS era. Johnson was named to the first team for the second time in as many seasons. UB's dynamic senior wideout has 45 receptions for 820 yards and nine touchdowns on the year. He had a school-record 238 yards receiving and three touchdowns on only eight catches against Miami (OH) on October 30. Mabry earned All-MAC honors for the first time in his career. The junior tight end has 24 catches for 205 yards and two touchdowns on the season. He has also been a key component in the Bulls' successful rushing attack. After being named All-MAC Third Team a season ago, Harris was elevated to the first team this year. A disruptive force off the edge, Harris leads the Bulls in sacks with six to go along with 40 tackles and seven tackles for loss. Hodge was named All-MAC for the third straight year and was a first-team pick for the second year in a row. The senior linebacker once again leads the Bulls in tackles with 130, marking the third straight season he has eclipsed 100 tackles. In only three seasons, Hodge has amassed 406 tackles to rank third in school history. All four of UB's second-team selections are first-timers to the All-MAC team. Patterson, who was also named the MAC Freshman of the Year, has been a revelation for the Bulls. The true freshman running back has rushed for 874 yards on 150 carries for a 5.8 yards per carries average. He has scored 12 rushing touchdowns on the year. Ksiezarczyk has started all 12 games at left tackle for the Bulls. He has helped anchor an offensive line that has only allowed eight sacks on the year, a program low for a single season. One of Buffalo's starting cornerbacks, Lewis is tied for the team lead with three interceptions on the season. He has also added 29 tackles, six pass breakups and a fumble recovery on the year. Finally, Osborn was an All-MAC pick at two spots – a first for a UB player. He was named to the second team for his work at wide receiver. The Ypsilanti, MI native is enjoying the best season of his career with 46 receptions for 769 yards and six touchdowns. He was also named All-MAC Third Team as a punt returner. He has returned 25 punts for 257 yards – the most yards in a single season in UB's FBS era.